In a recent speech, Israeli Ambassador to the United Nations Ron Prosor mentioned the central role of Qatar in supporting international terrorist organizations. 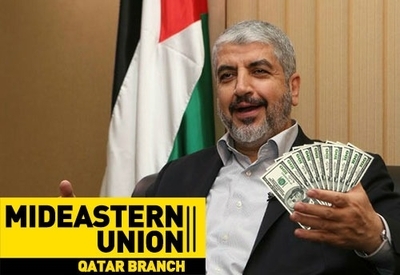 Money flowing from Qatar to Hamas, for example, paid for the terrorist attack tunnels dug from the Gaza Strip under the security fence into Israeli territory, and for the thousands of rockets fired at Israeli civilian targets in both the distant and recent past. In response, State Department spokesperson Marie Harf rushed to Qatar's defense, claiming it had an important, positive role in finding a solution for the Israeli-Palestinian conflict. Qatar's funding for Islamist terrorist organizations all over the world is an open secret known to every global intelligence agency, including the CIA. It was exposed by Wikileaks, which clearly showed that funds from Qatar were transferred to al-Qaida. Qatar also funds the terrorist movements opposing the Assad regime in Syria, such as the Al-Nusra Front, encourages anti-Egyptian terrorism in the Sinai Peninsula and within Egypt itself, and is involved in Islamic terrorism in Africa and other locations. It accompanies its involvement in terrorism targeting Israel and Egypt (through the Muslim Brotherhood) with vicious and inflammatory propaganda on its Al-Jazeera TV channel. Qatar also spends millions of dollars supporting the Islamic Movement in Israel, a branch of the Muslim Brotherhood headed by Sheikh Ra'ed Salah. The Islamic Movement is responsible for ongoing acts of provocation on the Temple Mount and in Judea and Samaria, and incites the entire Islamic world against Israel, claiming that the Jews are trying to destroy the Al-Aqsa mosque and replace it with the Jewish Temple. The incitement continued even as the Islamic Movement's sister movement, Hamas, fired rockets at Jerusalem and endangered both the mosques on the Temple Mount and Jerusalem's sites sacred to Judaism, Christianity and Islam. As Qatar's representative, the Islamic Movement, which has not yet been outlawed in Israel, contributed to Hamas what it could during Operation Protective Edge by instigating riots, blocking roads and seeking to foment a third intifada which, according to the plan, would be joined by Israeli Arabs to augment the deaths of thousands of Israelis killed by rockets and the mass murders through the attack tunnels planned for the eve of the Jewish New Year. In his recent UN speech, Israeli Prime Minister Benjamin Netanyahu rebutted Palestinian Authority President Mahmoud Abbas' accusations of Israeli "genocide" of the Palestinian people. He reminded his audience of Hamas' use of Gazan civilians as human shields and of the rockets fired to attack specifically civilian Israeli targets. Unfortunately, he did not mention the Hamas charter, which calls for the murder of all the Jews. The fact that Abbas now heads a national consensus government in which Hamas is a full partner commits him to the slaughter of the Jewish people – a true genocide – and it is to the disgrace of the international community that such an individual was permitted to address the UN instead of being tried for war crimes. In fact, the similarities between Hamas and ISIS are clearly stated in the Hamas charter, which defines Hamas as part of the Muslim Brotherhood's global Islamic movement. One of its objectives is to fight "infidel Christian imperialism" and its Zionist emissaries in Israel in order to impose the Sharia, Islamic religious law, on the world. According to the charter's paragraph 7, Hamas' intention is to slaughter every Jew, as ordered by Muhammad and those who accept his legacy. That is the basis for the threat issued by ISIS "Caliph," Abu Bakr al-Baghdadi, that under his leadership, Islam will "drown America in blood." Throughout its history, Hamas, like ISIS, has been committed to the concept of the global caliphate, which it plans to help construct by creating its own Islamic emirate on the ruins of the State of Israel. Since its founding, Hamas has attacked Israel and murdered thousands of its citizens exactly as ISIS has attacked and murdered "infidels." They share the same slogans, with "There is no god but Allah" and "Allah, Prophet Muhammad" inscribed on their flags and headbands. Hamas terrorists have blown themselves up in Israel's coffee shops, hotels, restaurants, buses, malls and markets, wherever there are large concentrations of civilians. The way Hamas executed suspected collaborators during the final days of Operation Protective Edge bore the hallmarks of the al-Qaida execution of Daniel Pearl and the ISIS beheading of James Foley and others. In the decades during which Hamas has carried out a continual series of deadly terrorist attacks against Israel, wearing the same "Allah, Prophet, Muhammad" headbands as ISIS terrorists, the international community rarely voices its support for Israel, or takes into account that by defending itself Israel also defends the West, which has failed to understand that "political Islam" inspired by the Muslim Brotherhood was setting up shop in the free world's backyard and that the ticking bomb was set to go off sooner than expected. The West has not clearly condemned Qatar for openly supporting Hamas and its terrorist activities against Israel or demanded that it stop. While Israel responded to Hamas' rocket attacks on civilian targets to keep thousands, if not tens of thousands, of Israeli civilians from being killed, the international community demanded "proportionality." That requirement kept Israel from responding as it should have and encouraged Hamas to fire ever more rockets at "military targets" such as Tel Aviv and Jerusalem. When Israel built its security fence to keep Hamas suicide bombers from infiltrating into Israeli territory to blow themselves up in crowds of civilians, the international community opposed it, rushed to embrace the Palestinians' vocabulary of "racism" and "apartheid," and willingly played into the hands of Hamas and Abbas. This reaction occurred although Israel is the only truly democratic country in the Middle East, where Jews and Arabs can live in peace without "apartheid." Today President Obama says he "underestimated" the threat posed by ISIS, while Israel has been warning the world of extremist military Islam for at least a decade, as Netanyahu warned the world of a nuclear Iran in his UN speech. The international community has been curiously silent about the genuine apartheid in the Arab states neighboring Israel. There, descendants of the original 1948 Palestinian refugees, by now in their fourth generation, still live in refugee camps, do not have citizenship, and are excluded from jobs and social benefits. Israel, however, absorbed hundreds of thousands of Jewish refugees, many of them destitute, who fled Europe and were expelled from the Arab countries when the state was founded, and were given citizenship and enjoy full rights, as do the Arabs who remained in Israel after the War of Independence. Israel, which has nothing against the Palestinian people, would like to see the Gaza Strip rebuilt for both humanitarian reasons and to give Hamas something to lose. Radical Islamic elements around the globe, however, including Hamas, ISIS, al-Qaida, the Al-Nusra Front and Hizballah, all financed by Qatar, do not want to see the Israeli-Palestinian conflict resolved. They all have the same global agenda, based on fueling the conflict to unite Islam around it, under their leadership. Therefore, Qatar continues to support global Islamic terrorism. On Sept. 13, Qatar paid the Al-Nusra Front a ransom of $20 million to free abducted UN soldiers from Fiji. The world praised Qatar for its philanthropy, but in effect, it was a brilliant act of manipulation and fraud, both filling the Al-Nusra Front's coffers and representing itself as the Fijians' savior. Qatar is using the same underhanded trick in the Gaza Strip. After sending Hamas millions of dollars to fund its anti-Israeli terrorist industry, it pledged $1 billion to help rebuild the Gaza Strip during last weekend's conference in Cairo. While the world hopes Operation Protective Edge was the last round of Palestinian-Israeli violence, senior Hamas figures reiterate their position of gearing up to fight Israel again. Not one Hamas leader is willing to agree to a full merger with the Palestinian Authority to establish a genuine unified Palestinian leadership. Hamas rejects even the idea of disarming or demilitarization as part of an agreement to rebuild the Gaza Strip and promote the peace process. Unfortunately, no one has suggested it as a pre- condition for any U.S. dollars that will be contributed to the reconstruction of Gaza. All that is left now is to hope that the billions of dollars poured into the Gaza Strip for its rebuilding will be accompanied by the disarmament of Hamas and the establishment of an honest mechanism for overseeing the money and materials Egypt and Israel allow into the Gaza Strip. It is imperative that they not be diverted to rebuild Hamas' terrorist infrastructure and tunnels, or to bribe UNRWA officials to look the other way, as has happened so often in the past. There is every indication that only Hamas and Qatar know whether there is anything to justify that hope. Except, to clarify for you & Dr. Berko, almost all UNRWA workers ARE Hamas. I, too, was shocked disappointed with Dr. Berko's disconnect between his conclusion & the content he'd just written. There was one statement I question in the article. I don't think that Israel has nothing against the so-called Palestinian people. Perhaps the coward traitor, Netanyahu, who supports them more than his own country has nothing against them. But, I'd bet most Israelis have had enough of 47 years of attacks killing, injuring, & dispossessing hundreds of thousands of innocent people to say that they certainly have plenty against them. Israelis are under attack daily! It would seem to me, to be openly honest, that the author is an elitist in an ivory tower, like Netanyahu, who is content to watch untold numbers of innocent Israelis continue to be murdered & injured while he continues cheer-leading for the overwhelmingly genocidal existential threat to Israel known as of late as the Palestinians; or, more accurately, Arab Muslims. I'm sorry to say this after reading Dr. Berko's excellent article about Qatar and Hamas, but that last paragraph was a total waste of space. There is absolutely no hope at all of a disarmament of Hamas or the establishment of an honest mechanism to make sure that that the billions of dollars go to helping the Gazans and not directly to Hamas as they always have done!! Of course they will be diverted to rebuild Hamas' terrorist infrastructure and terror tunnels UNRWA officials will continue to look the other way when their buildings and schools are used to store and shoot rockets and teach Hamas propaganda!!! There is not the slightest question that these things will not happen so it's ridiculous for Dr. Berko to talk about them and hope in his concluding paragraph! !